Nirox park South Africa, near Johannesburg, Cradle of mankind. Drs Kees Kaldenbach. stadstours, kunstmuseum rondleiding met gids, kunstrondleidingen. privat, fuehrungen, auf Deutsch, . Drs Kees Kaldenbach. Fast track entry in ALL Dutch art museums. Avoid spending time waiting in museum queues. Enter the museums together with me. In the South African Cradle of Mankind, some 45 mins drive from Johannesburg, lies a landscaped park with scattered sculpture. To find this landscaped park in the middle of wild and rough South Africa is like entering in a magical Wonderland... of art and nature. It opened in 2007 and I was there for a visit in December, 2013. An international artists' residency programme (all arts). The complex lies 45 minutes outside Johannesburg in the Gauteng Province of the Republic of South Africa. 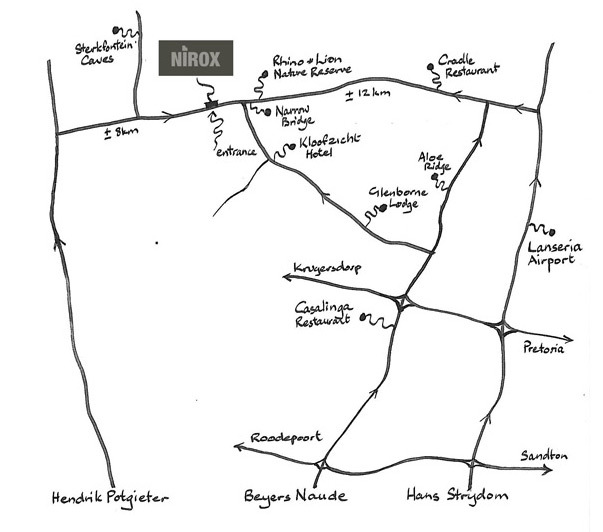 NIROX is committed to excellence and to advance Africa's place in the global contemporary arts. By the entrance. Phone the staff to get in, when the gate is closed. When preparing, make a note of the phone number! Work of sculpture in a very hard, highly polished natural stone. A monster reminding us of Goya, looming in teh distance. Made of earth materials and wood. More landscaping and sculpture in the park. GPS Co-Ordinates : S25°59' 09.56'' E27° 46' 59.17"
Author on fallen tree. Big storms just ended. My husband and I travel the world to stay alive -- to see with new eyes and stretch our minds. We love museums and fine food, sometimes stopping at out of the way Michelin-starred restaurants. With Drs. Kees Kaldenbach we had the best of both worlds. During the day we took a car trip to the Kröller-Möller sculpture garden and fine art museum, where we would certainly have missed the hidden staircase leading into the astonishing Jean Dubuffet's Jardin d'Email without him. Inside the museum, he gave us a humanities course on Impressionist painting, our favorite kind of art. Later that day we drove to a picture-perfect village between Utrecht and Amsterdam, boasting a fine restaurant with one Michelin star, and there the three of us enjoyed an exquisite meal to end a perfect day. To fully enjoy Holland, you need a guide like Drs. Kaldenbach. Photo below: Kroller-Moller sculpture park in Otterlo, Holland. This is the country where I live and do my tours. Photo: the Needle tower by Kenneth Snelson, in winter position, laying on its side and being cleaned with a high pressure hose. March 8, 2013. Installing a new art work. Artist: Ana Maria Tavares. Title: Secrets of the waters (for Mnemosyne). 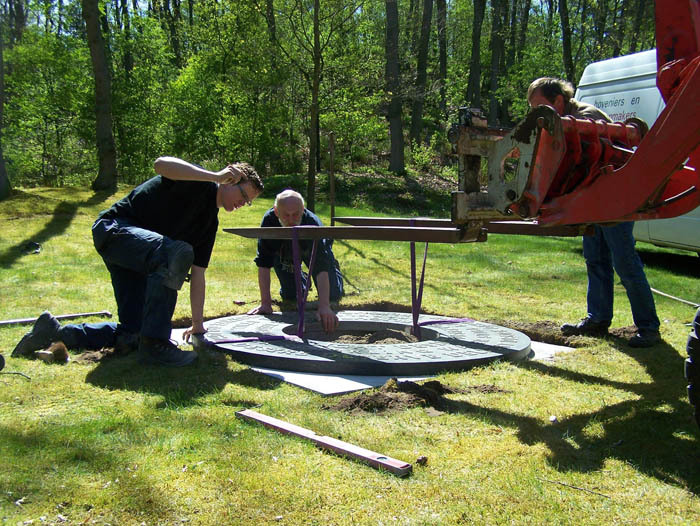 Number: 5 parts, each 200 x 200 x 6 cm thickness, granite and stainless steel disc and letters. I have been told by my clients that another very good art park exists in the USA: Storm King Art Center, north of New York City, in the Hudon Valley. Starting at your hotel I will take you on a wonderful car tour of your choice. My guided itinerary offers you accessable informative conversation in English, Dutch, or German (my French and Italian are more limited). You may also arrange this VIP treatment for business contacts or friends. Our cultural tour organisation office will take care of a unique and memorable experience. Drs. 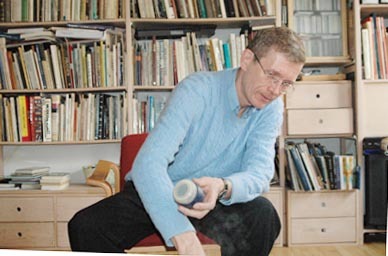 Kees Kaldenbach is your private "scholar-lecturer on culture tours" *. *Martha Gellhorn, Travels with Myself and another, p. 182. Please contact me for time and fees of the tailor-made tour you ar interested in. Drs. Kees Kaldenbach has been featured in television and radio documentaries, including BBC2 TV, NTV Japan, Danish TV and Radio Netherlands World Service. In July 2004 he was interviewed about Delft artists by Tetsuya Tsuruhara for the leading Japanese newspaper The Yomiuri Shimbun. In 2004 and 2005 he acted in an advisory role to additional BBC teams. Kaldenbach has written extensively on Vermeer and 17th century Delft, on Vincent van Gogh and on other art history topics. Drs. 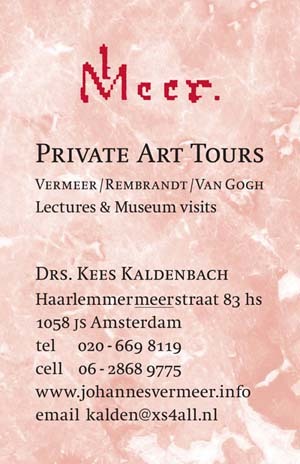 Kees Kaldenbach is your private "scholar-lecturer on culture tours". Member of the VVV Tourist information and the Amsterdam Chamber of Commerce (Kamer van Koophandel). Email responses and bookings to art historian Drs. 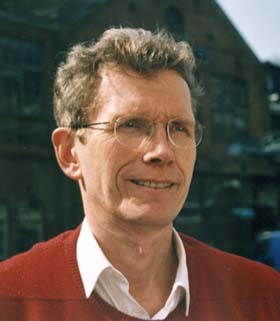 Kees Kaldenbach. Updated January 16, 2014. Updated June 9, 2016.